In The Pursuit of Pretty Shoes: Hi Ho, Hi Ho . . .
it's back to work, I go! After a very quick three weeks recuperating at home, I made it back to work "all by myself!" today (seriously, where's my piece of candy or Atta Boy?!). Luckily, the insurance company approved a "scooter" for me to use to get around in replacement of crutches. It doesn't have the luxury of power steering, it doesn't stop on a dime, and it doesn't have any measurable horsepower; but, I can get a good downhill speed if the conditions are right! 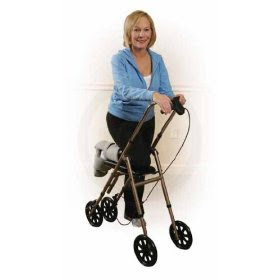 Nonetheless, it's a lot easier on my body and much more steady than crutches any day . . . I can actually reach my office on the 42nd floor without getting out of breath (too much). I can only sit comfortably in my office for about 6 hours before my foot begins to throb, but it's rewarding to be part of the outside world again! White Drifted History In The Making . . . I Feel Pretty, Oh So Pretty . . .